Welcome to Pałacowa Restaurant at Arkadia Royal Hotel. Our excellent chefs use the finest ingredients to ensure that perfection appears on your table. 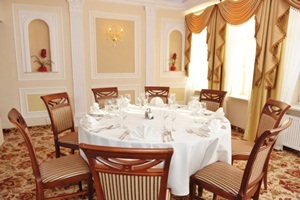 Our menu focuses on the "modern" classics of Polish cuisine, however, it is not limited to it. Each month we serve our guests the best regional dishes from all over the world, providing the opportunity to experience the abundance of tastes and aromas offered in each corner of our globe. Our cuisine is created by people who have a passion for cooking. Food is their lifestyle. The menu changes periodically to allow you to fully appreciate the seasonal nature of our products. Our menu of the day or month is a reflection of the inspiration of our cooks and the availability of the freshest ingredients. As a result, we create the most interesting, world-class dishes every day. Nothing is impossible in Pałacowa restaurant. In consultation with our Chef, our personnel will gladly prepare special dishes, which are not available on the menu, just for you. We invite you for a culinary experience in Poland which lets your taste buds enjoy a trip around the world.